Missing persons report filed for Florida resident, author and ex French intelligence agent, Hervé Jaubert - last heard from off the coast of India. This release is issued to assist authorities with the search for three missing people and to update the world’s media. 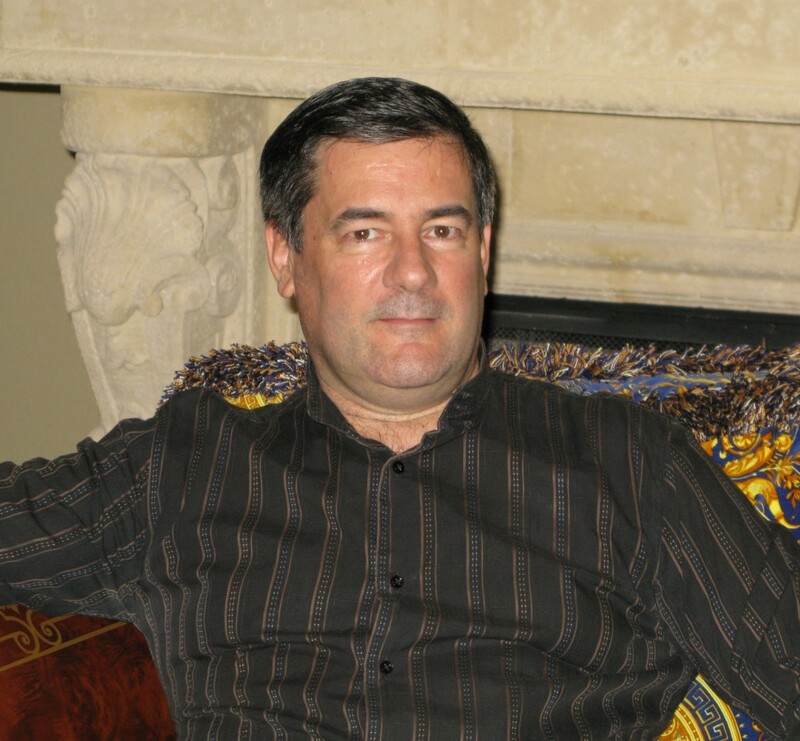 British NGO Detained in Dubai received a plea for emergency assistance from American/French national Hervé Jaubert, famous for his book “Escape from Dubai”. Hervé and a young woman who claimed to be a daughter of the ruler of Dubai, Vice President and Prime Minister of the United Arab Emirates, Sheikh Mohammed bin Rashid Al Maktoum, made contact with Detained in Dubai to seek assistance. 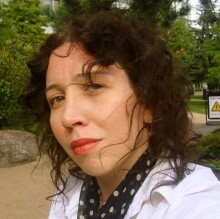 They said that they were “escaping” the United Arab Emirates to seek refuge in the United States, following the woman’s claims of “imprisonment, torture and abuse”, the details of which are described in a YouTube video that was sent to a US attorney for publication in the event of her disappearance or death. Their identities have been confirmed by a number of parties. Herve advised Detained in Dubai that he was helping the woman “escape Dubai” on board a US registered vessel. They were approaching India on Sunday the 4th of March 2018 and were within 50 miles as of 11:00 GMT, with the plan to disembark and fly to the US from Mumbai. 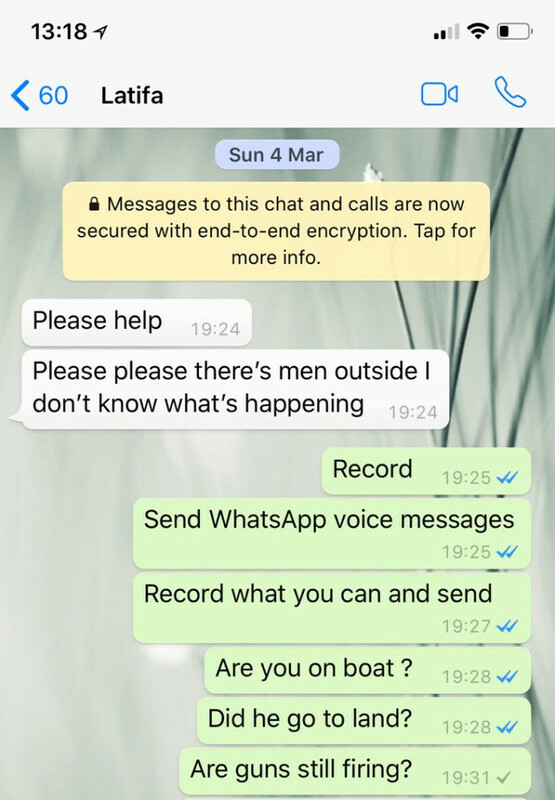 A distress call was made seven hours later from Sheikha Latifa to Radha Stirling, then contact ceased immediately and permanently. An American man, an Emirati woman and a third woman, believed to be Finnish have all been reported as missing. Since then, a prominent British barrister, Harpreet Singh Giani who is also an Indian advocate, has confirmed from his sources within the Indian intelligence community that Sheikha Latifa is alive and that she has been “taken back to Dubai”. Mr Giani was unable to comment whether there was any military involvement by either country. We are therefore calling on an investigation into an incident that potentially involves the kidnapping of three parties who are likely to have been in Indian territorial waters. There have been further reports that an Electronic Warfare Aircraft was in the vicinity, a craft designed to interrupt communication platforms which would have required India’s cooperation. Detained in Dubai was contacted by a woman who identified herself as a Sheikha Latifa Mohammed Al Maktoum the daughter of Sheikh Mohammed bin Rashid Al Maktoum, and a man who identified himself as Jean Pierre Hervé Jaubert, who was known to Detained in Dubai’s CEO, Radha Stirling. Immediately upon initial contact, Detained in Dubai commenced steps to verify the identity of the parties and the claims made. 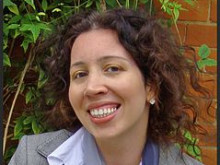 British Solicitor David Haigh was able to contact various third parties who confirmed the identity of Sheikha Latifa. During this process there was regular and lengthy contact between the missing persons and Detained in Dubai. On Sunday the 4th of March, Ms Stirling was advised by Hervé at 11:00 GMT that the vessel was within 50 miles of India and that they intended to disembark imminently. At 18:24 GMT, Ms. Stirling received a distress message, followed by a distress call from the woman who appeared in a panicked and frightened state. She stated "Radha, please help. There are men outside. I hear gunshots and I am hiding with my friend". Following the distress call, communication with all of the missing persons ceased. Having had communication with the missing person previously, and following the distress call, Detained in Dubai alerted the relevant authorities. Detained in Dubai further sought the assistance of leading human rights Barristers and Queen's Counsel together with the assistance of several leading human rights charities with which Detained in Dubai works. Detained in Dubai filed a police report with the Metropolitan police, the UAE Embassy in the UK, the United States State Department and the Coast Guard of India. The only authority who has responded is the United Kingdom who have forwarded the report to the National Crime Agency and Interpol for investigation. Two US attorneys confirmed that they were aware of the situation and had been contacted by American and French national and Florida resident Hervé Jaubert, a client of theirs, who was also known to them. They have since prepared a missing persons report. The @MailOnline broke the news on Friday and showed part of a video where the woman explains some of the reasons for her escape attempt. The video was provided to a US attorney by Latifa for distribution in the event of her death or disappearance. The video extends for around 40 minutes and makes claims that she was "imprisoned, tortured, beaten and censored” as well as going onto name those involved and setting out various potential crimes. That video was provided to the authorities and legal advisors. The full video has since been published on YouTube by a variety of sources. Radha Stirling, who was the last party to speak with the missing persons said "We are very concerned for the safety of the missing persons. We have already been inundated with calls and emails and evidence that assist us and the authorities. We appeal to anyone for any information that could be helpful to please get in touch with us. We would also like to appeal to anyone that can assist with the search. Lawyers, Human rights organisations, friends, family or even the general public. The missing persons requested our assistance and instructed us to assist them in in the event of their arrest or disappearance, which we are now doing. We are liaising with authorities, leading human rights lawyers and human rights organisations. We are seeking response from US, British, Indian and UAE authorities on this incident. A US national and his American registered boat have gone missing, as well as Sheikha Latifa, with Indian intelligence suggesting that they are now in the custody of UAE authorities against their will." * Extensive Evidence Pack Compiled for Authorities. 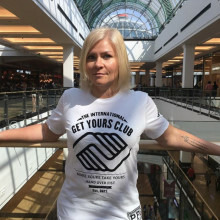 Is the Finnish citizen also found and returned to Dubai? She is not Brittish as the article wrongly says. Yes, she is now confirmed to be Finnish. Is Tiina also back in Dubai? We have no official confirmation of their whereabouts or status. Poor lady has been sent back to her oppressors. They sent her back to the very place she wanted to flee from. One wonders if everyone is in this together to silence her. And what of her former intelligence officer friend? Surely he has been bumped off in the process. Despicable. Missing persons report filed for daughter of Dubai’s ruler and American National after distress call was received by British NGO Detained in Dubai. مؤسسة Detained in Dubai البريطانية غير الهادفة للربح، تقوم بعمل محضر بأشخاص مفقودين لكل من ابنة حاكم دبي ومواطن أمريكي، بعد أن تلقت نداء استغاثة! Detained in Dubai offer help to UAE Embassy regarding the Emirates’ international image problem. 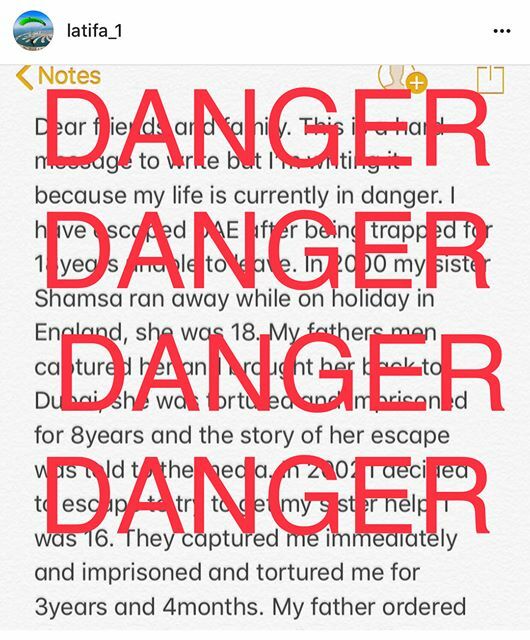 On Friday UK based NGO, Detained in Dubai, approached the UAE embassy in London with a written offer to share experience and advice regarding the alarming and seemingly indiscriminate detention of visitors in the Emirates. 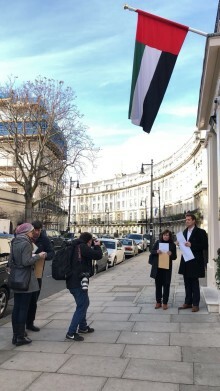 Detained In Dubai partner David Haigh hand delivered an open letter to the UAE embassy in London’s Belgravia. London based legal organisation Detained in Dubai is being temporarily protected by counter-terrorism services following a bomb threat that was apparently spurred by the group’s filing of a police report for the missing Dubai princess Sheikha Latifa Al Maktoum and the dual French/American man who helped her flee the UAE.